Welcome to Toontown where cartoon characters – Toons – live side-by-side with humans. The whole Who Framed Roger Rabbit cast is here: Roger Rabbit, Eddie Valiant, Baby Herman, and of course Jessica Rabbit, the sultriest woman ever "drawn that way." They're up to their old tricks in a whimsical new mystery by Toontown's original creator, the man who first brought these delightful creatures to life. Who P-p-p-plugged Roger Rabbit? opens with a call from Roger to hard-boiled private eye Eddie Valiant. Roger suspects that Jessica is baking her carrot cakes for movie heartthrob Clark Gable. The scandal threatens to rob Roger of the Rhett Butler role in the soon-to-be-filmed Toon musical comedy Gone with the Wind. Investigating Jessica's alleged affair, valiant Eddie finds adultery turning to murder. In no time flat, he's up to his fedora in a nasty web of deceit, intrigue, and Hollywood corruption including reports from all over of a swindling, cheating, blackmailing….Roger!!?!?! Something is really p-p-p-popping in Toontown! Some of the wildest creatures seen in fiction (and real life) abound: Police Sergeant Bulldog Bascomb, a full-blooded hound with razor-sharp teeth sunk into Eddie's case: Heddy, Eddie's sister and possible prime suspect; Kirk Enigman, a very "shadow"-y guy; and Joellyn, Jessica's twin sister, shockingly different in one small way! As if this isn't enough, human luminaries run fast and furious. In addition to Gable, David O. Selznick, Carole Lombard (Baby Herman's latest plaything), and Vivien Leigh (Valiant's dalliance?) all play a role. Who P-p-p-plugged Roger Rabbit? 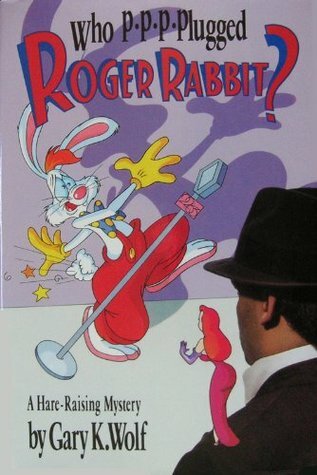 is a comically brilliant sequel, as unique and original as the first time we saw Roger and Jessica together in Wolf's Who Censored Roger Rabbit?, the book that kicked off the whole Toon craze.